1In a medium saucepan, bring vegetable broth and white wine to a boil. 3Add lentils. Cook for 20-25 minutes or until liquid is gone. Set aside. 5Preheat oven to 350 degrees. 7Spray a medium saucepan with cooking spray. 9Saute onions, bell peppers and spinach until onions are clear. 11Spray an 8 x 8 baking dish with cooking spray. 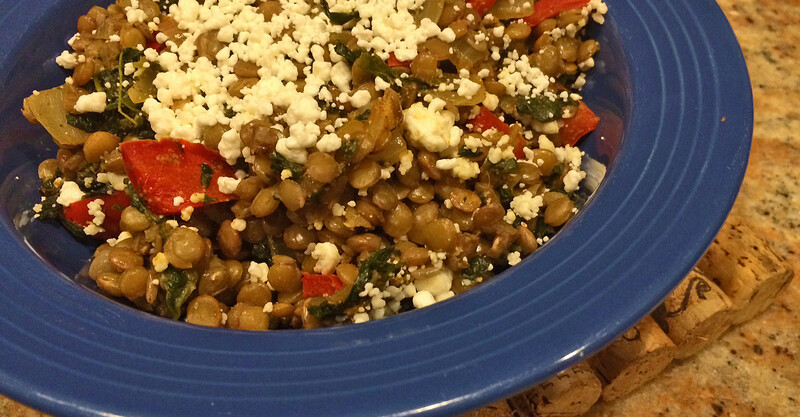 13Combine lentils, onions, bell peppers, spinach, garlic powder and chili powder in dish. 17Bake for 10-12 minutes or until cheese is melted.